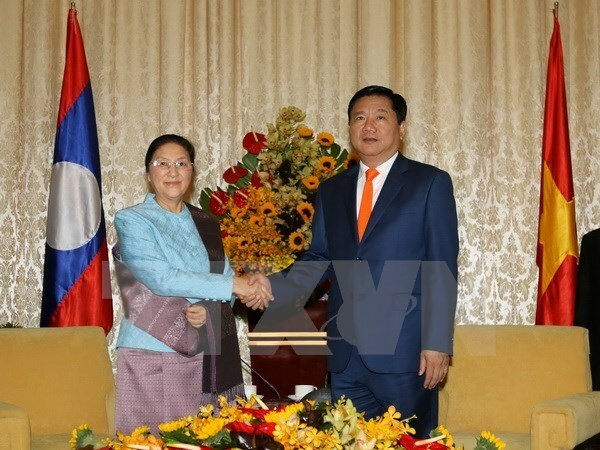 Ho Chi Minh City (VNA) – HCM City’s Party Committee Secretary and Politburo member Dinh La Thang on March 9 received Pany Yathotou, Chairwoman of the Laos National Assembly, who was visiting Vietnam. Thang welcomed Yathotou’s visit, which has contributed to developing the friendship between the two countries nurtured by late Presidents Ho Chi Minh and Kaysone Phomvihane and generations of leaders of the two Parties, States and peoples. On behalf of the city leaders, Thang affirmed the wish of the city’s Party, government and people to deepen ties with Laos’ localities, including Vientiane and Champasak. The city is very interested in cooperation and sharing experience between the municipal People’s Council of the city and its partners from Laos’ localities via exchanging delegations, Thang added. He stressed in 2017, the city will hold many activities to mark the 55th anniversary of the Vietnam-Laos diplomatic relationship and the 40th anniversary of the Vietnam-Laos Friendship and Cooperation Agreement, showing the city’s desire to develop cooperation with Laos’ localities. Chairwoman Pany Yathotou expressed her belief that Vietnam and HCM City will bring the 12th national Party Congress Resolution into life successfully.